As with Agricola and Ora et Labora, Nusfjord has a worker placement mechanism, with each player starting with three workers that they place on a central board to trigger certain actions. Whether a player wants to clear a forest on their own board, buy a new cutter, or construct a building, they must place a worker on the appropriate space - which is possible only if room is available for this worker. Money is scarce, and one of the quicker and easier ways to get it is to place shares of your own company on the market. This risky action could be worthwhile because if you succeed in buying these shares yourself, you have usually won money and not suffered any disadvantages; however, if an opponent acquires these shares, then you must allow them to benefit from your hard-earned catches at sea. The village elders might want their own share of your catch as well, especially if you've visited them to take certain actions in the village, so if you don't take care, your catch could end up entirely in the hands of others and your camp will be empty. 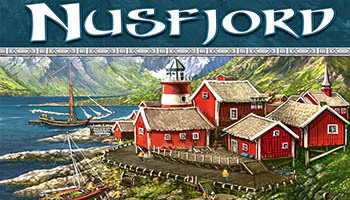 As the owner of a major fishing company in Nusfjord on the Lofoten archipelago, your goal is to develop and expand the harbor and the surrounding landscape. 9 multiplication tiles 3x "5 fish"
We will explain the actions by column, as they appear on the Action board. When you take this action, take 1 gold from the general sup- ply and place it in your personal supply. Note: Every Work Phase, this action space may be occupied by at most one Worker. Prepare the game as you would a 2-player game. Use the solo game First Player tile, turning it to the side showing "Solo Game", and place the First Player ship on Round space 1. For your personal display, only use the red player-specific components and, additionally, the blue Worker disks. Also place the Imitation tile alongside the bottom edge of the Action board, with the 4-player game side facing up (showing one action space).